Tim and Dee, married couple from Sydney have to beat Carmen and Lauren’s score of 51 to avoid MKR elimination tonight. The team are making a Spanish menu. For entree, Tim and Dee are making Lentejas, a Spanish lentil soup with chorizos. For main, they are making Albondigas con Patatas Bravas, a dish of Spanish meatballs and potatoes. Finally, for dessert they are making Flan De Huevo, a spanish creme caramel. Who will be eliminated from My Kitchen Rules tonight? They spend a long time doing the shopping for their ingredients, but when they finally get back they set up their restaurant, “Buen Via Je” and only have 2 1/2 hours to cook. They start on the bread. They’re running behind. Once they finish the bread they only have 30 minutes to start cooking their main. One of the bread mixes is not working out properly and Dee has no idea why. Dee is in tears as the bread is ruined. She is also mad at Tim for ruining the onion. Tim comes to the rescue and adds more flour to the bread mix, he is happy with the consistency. They take the flans out of the oven and they are pleased that they are looking good. Dee realises that she has forgotten the ham hock for the lentil soup, she places it in and boils the soup again. The guests start to arrive. Dee and Tim are dressed and ready to receive their guests. Tim is making the sangria and he spills the red wine. Dee is mad at him because she says he shouldn’t even be making it in the first place and she hopes he hasn’t gotten any into the flans. The guests are not overly impressed with the decor of the instant restaurant. Tim and Dee get back into the kitchen to continue preparing the meals. The judges arrive. The menu is revealed and as it is written in Spanish the guests don’t really know what to expect. Dee and Tim are back in the kitchen and cannot find any cumin. Dee is demanding that Tim find the cumin. She said that cumin is such a Spanish flavour. They decide to serve the soup without the cumin. They plate the dish up and take it out to the guests. Colin and Rachel taste the soup. Colin says the dish had a wow factor when it arrived but then he tasted it and the soup was undercooked. The lentils were underdone and the onions as well. He said it was not very good. Rachel said it looked beautiful too. She said the flavours didn’t come through tonight. 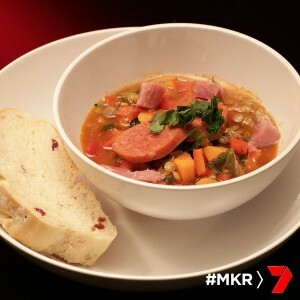 The other contestants are tasting the dish, the vegetables are raw and the soup has a watery taste. The one thing they did like was the bread. Will this send them to elimination? Dee and Tim get back into the kitchen to make the meatballs.They are toasting their own breadcrumbs from the bread they made earlier. The timer goes off and Dee says to Tim that those breadcrumbs better not be burning, they check the oven and the bread is totally burnt. They decide to use packet breadcrumbs instead. Dee prepares the meatball mix and Tim rolls them into balls. Dee tells him to roll them faster and neater. She is very conscious of the time getting away from them. It has been an hour and thirty minutes since the entree. Carmine and Lauren are hoping this might save them from elimination. Dee has whipped up a sauce to add to the meatballs. Tim checks a meatball to see if it’s cooked but it’s raw. The gas is not even on. Dee is getting really mad with Tim now. Tim is using a tiny pan to cook the meatballs so Dee tells him to put three pans on at once. They plate the dish up and take it out to the judges. Colin and Rachel taste the dish. Colin says the dish looked like it was all thrown together. The meatballs were undercooked. Rachel agrees that the meatballs should have been cooked in a sauce. The potatoes should have been par boiled to get the fluffy insides. The other guests taste their meals. Their meatballs are raw. The sauce tastes raw with raw onion and garlic flavours. It’s on to dessert. They flip their creme caramel. 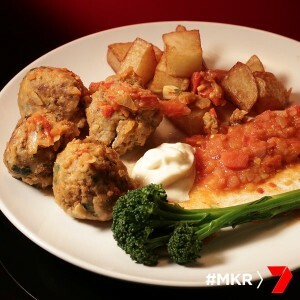 This dish needs to work to save Tim and Dee from MKR Elimination. It works. The creme caramel looks good. There are two that break, they agree to give them to Carmine and Lauren. They weren’t happy with it. The first judge to comment on the dish is Rachel. She said it was beautifully presented and the vanilla flavour was delicious. However, they could have pushed the caramel a bit further to give it a more bitter flavour. Colin is happy with the dish and the fresh vanilla in the creme caramel. He would have liked more caramel, but they did a good job. Lauren comments on the night, she tells everyone she hopes there are no sympathy votes because Dee cried. 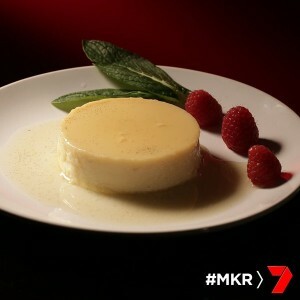 Who is eliminated from MKR? Here are the scores. Tim and Dee have been eliminated from My Kitchen Rules tonight. Colin says goodbye to Rachel, she’s left the show. Now for the twist, all the teams enter with Pete and Manu. There is one final chance at redemption, the bottom teams from each round are cooking off against each other and two teams will be eliminated.